Sixty-six years ago this month the Forest Leaves published a series of full-page ads with the title: “Help Fight Infantile Paralysis”. The ads include images of young children affected by the disease as well as facts explaining the number of cases of polio, or infantile paralysis, in the United States increasing from some 15,000 in the late 1930s to over 100,000 between the years 1948-1950. 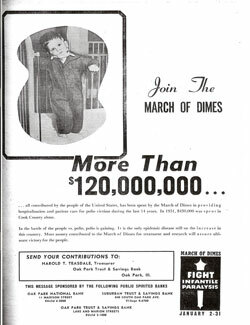 The main fund-raising agency devoted to stemming this rising tide of crippling disease, the March of Dimes, had raised some $58 million in the years 1948-1950. But the ad pointed out that the funding for a cure was being outpaced by the rising number of victims. Forest Leaves readers were urged to donate to the local March of Dimes chapter headed by the Treasurer of the Oak Park Trust and Savings Bank, Harold T. Teasdale. They could not have known it then but 1952 would produce the worst epidemic in American history, with 58,000 cases in that year alone, resulting in over 3,000 deaths and more than 21,000 permanently disabled survivors. This same disease that had stricken Franklin D. Roosevelt as an adult was particularly devastating to children. It struck fear in the minds of parents who forbid their children from swimming in public pools. Fear of polio was second only to the threat of atomic attack among Americans in the early 1950s. However, in 1955 Dr. Jonas Salk introduced the first effective vaccine. His research had been funded by the March of Dimes. As a result polio was effectively eradicated in the United States and today worldwide there are only about 1,000 reported cases. Thanks to Salk’s work, the shadow of polio of 1952 no longer darkens America’s future. Sources: Forest Leaves, Jan. 10, 1952 p. 46, Wikipedia, “Jonas Salk” accessed 1 / 4 / 12.